Dead zones in the ocean are just what they sound like—areas where nothing lives, because fertilizer has been washed to the sea, often by spring melts and floodwaters. The fertilizer doesn’t directly kill anything; instead, it causes algae blooms as oceanic plants are stimulated to sudden growth by nitrogen in the fertilizer. All fine and good—but the plants also need oxygen, and somehow they seem to be more aggressive and successful in getting it than anything else around. The result? Fish, clams, mussels, crabs, shrimp, all die. You’ve probably heard of red tides, especially if you live on the Atlantic or the Gulf coasts, where they shut down fisheries and beaches on a near-annual basis. They’re famous for poisoning shellfish, and for the dramatic red tint they lend the ocean. 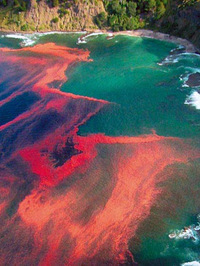 However, red tides are not always red, and not always toxic. (The one pictured here–which I lifted from the Woods Hole Harmful Algae home page–is indeed red, but non-toxic.) They’re caused by the release of chemicals produced by algae—minute forms of algae, not the big strands of seaweed you find on the sand. During algae blooms, those chemicals are sometimes visible as red washes in the ocean. If they’re toxic, then during blooms they are present in concentrations great enough to threaten both marine life and humans. Over the last several decades, the United States has experienced an escalating and worrisome trend in the incidence of problems associated with harmful and toxic algae (commonly called “red tides”). Formerly only a few regions were affected, but now virtually every coastal state is threatened, in many cases over large geographic areas and by more than one harmful or toxic species. Impacts include mass mortalities of wild and farmed fish and shellfish, human illness and death from contaminated shellfish or fish, death of marine mammals, seabirds and other animals, and alterations of marine habitats or trophic structure. 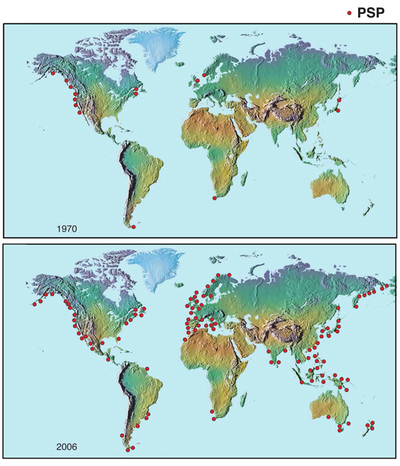 There’s a similar statement about the extraordinary expansion of algae blooms worldwide, accompanied by a couple of frightening maps, reproduced here. So that’s how it works, apparently: nitrates from fertilizer promote algae blooms, which cause both the sometimes red, sometimes toxic, red tides and the lethal dead zones. What is it going to take for us to stop poisoning ourselves? Hopefully the information coming out in the news will make people think twice about what they are putting in their lawns and gardens!